Nestled near the Four Corners in northwestern New Mexico, Farmington is a small town that thinks big. The town of just 40,000 has enough historic sites, recreation hotspots and cultural activities to entertain millions. With it's wealth of entertainment, it's no surprise the town draws a steady stream of vacationers throughout the year. Some of Farmington's most popular attractions are the several Anasazi archaeological sites located nearby. 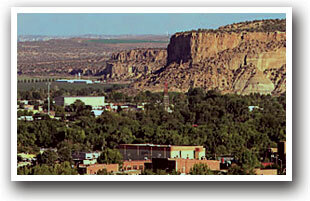 Aztec Ruins National Monument is just a few minutes east of Farmington. Despite its name, the site was never home to the Aztecs but is thought to have been the religious center of the Anasazis, ancient Puebloan people who thrived in the area around 1100 A.D.
Other Anasazi ruins are scattered around the region & among them, Salmon Ruins, Chaco Culture National Historic Park. More adventurous vacationers can check out Chokecherry Canyon, a sort-of mecca for off-road enthusiasts. Or tug on a swimsuit and visit Navajo Lake for boating, fishing and swimming. When it's time to relax, vacationers can hit the links at Farmington's award-winning Pinon Hills Golf Course, check out the Farmington museum or visit Lions Wilderness Park Amphitheater for outdoor shows in the summer. Located 10 minutes from downtown Farmington, SunRay Park and Casino also offers slot machines and horse racing for anyone wishing to try their luck. Win or lose, though, any vacationer who bets on Farmington will feel like they've won the jackpot.